Septoplasty is a procedure that straightens the rectangular-shaped cartilage and bone that divides our nasal passage in half-the nasal septum. The septum may be crooked from birth or may be damaged due to trauma, such as a strike from a ball or a fist, or even a bad fall. When crooked, the septum generally blocks one nasal passage only, however because of the “nasal cycle,” patients may feel difficulty breathing through both nostrils at times. Nasal cycle: the process by which our turbinates sequentially enlarge and then shrink on first one side of the nose and then the other. The side on which the turbinates are enlarged will experience less air flow. 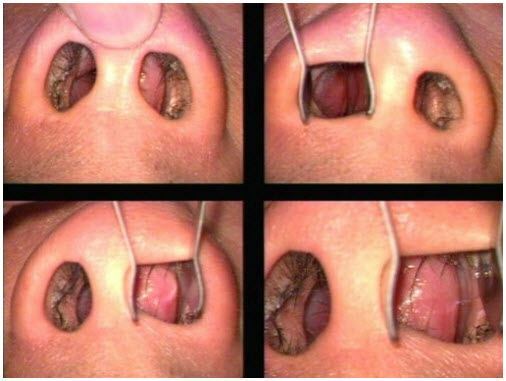 If the non-enlarged side has a spur or kink from a deviated septum, then the patient will feel blocked on both sides; whereas, if the septum is straight, then the nasal cycle should not affect breathing. 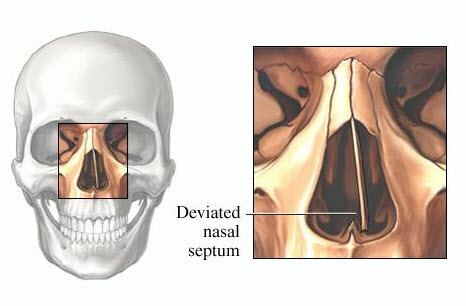 A deviated septum can predispose to sinus infections, poor sleep or snoring, decreased performance in sports, and mouth breathing with subsequent jaw deformity. For all these reasons, patients with deviated or crooked septums may seek surgery to correct this structural deformity. The first step in diagnosing and treating a deviated septum is a consultation with a board certified ENT specialist or Facial Plastic Surgeon. The doctor will take a thorough history and perform a physical examination to determine if septoplasty will improve your breathing. If the diagnosis is unclear, a trial of medication may be in order to treat underlying allergy or infection. If, however, a fixed rigid obstruction caused by bone or cartilage is present, you may be a good candidate for septoplasty. *Septoplasty is usually performed under general anesthesia or IV sedation at our San Diego center. Numbing solution is injected into the membranes alongside both sides of the nasal septum. The mucosal layers are then carefully lifted to expose the crooked cartilage and/or bone causing obstruction. The crooked portion may be straightened in place, removed/straightened/ and replaced, or simply removed. The mucosal or skin layers are then sutured back together. A firm splint may be applied to each side of the septum for one week to ensure that it maintains the new shape as it heals. Septoplasty surgery is considered very safe, however complications may include nosebleeds, recurrence of obstruction, and rarely a septal perforation or tear. Fees for septoplasty surgery in San Diego are generally covered by insurance. Please contact our office for more information. The nasal turbinates are paired structures located on either side of the nasal septum. Their function is to humidify and warm the air we breathe. Sometimes, due to allergy, trauma, or congenital deformity, the turbinates can become chronically inflamed and/or enlarged, leading to obstruction. 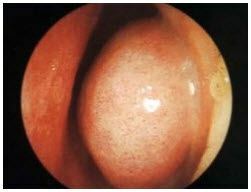 Enlarged turbinates will sometimes respond to medical therapy; however, surgery is often needed to restore airflow. One common method of addressing enlarged turbinates is with radiofrequency, which can ablate the soft tissue while leaving the outer mucosa intact. It is important to preserve the outer mucosa of the turbinates to avoid scarring or dryness in the nasal cavity. 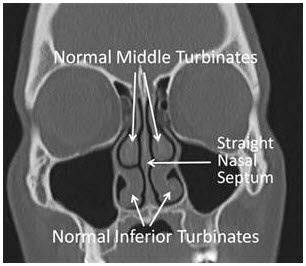 Turbinate reduction can be performed quickly and easily at the same time as septoplasty surgery, or as a separate procedure with mild sedation. Our private outpatient surgery center is fully accredited by the Accreditation Association for Ambulatory Health Care, or AAAHC. General anesthesia is provided by a board certified anesthesiologist, and patients recover in a private recovery room. The advantages of outpatient surgery include avoiding risk of contamination and the lengthy stay or wait times associated with hospital exposure. You will check in 30 minutes prior to your procedure, and receive personalized care from our attentive staff throughout your visit with us. *We find it unnecessary to pack the nose after surgery. Using advanced surgical technique to minimize bleeding, our patients often go home able to breathe better on the first night after septoplasty surgery. Pain is minimal following septum or turbinate surgery, however pain medication will be provided. Most patients resume normal activity the next day. If internal splints are placed, these are generally removed one week later. While mild swelling is normal, breathing should be noticeably improved at the one week point.